This is the second part of a three part interview with Stephanie O'Dea of A Year of CrockPotting. Be sure to start reading with part 1. In this part, Stephanie talks all about cooking in CrockPots (of course!). Stephanie recomends a 6 quart oval CrockPot for a family of four. 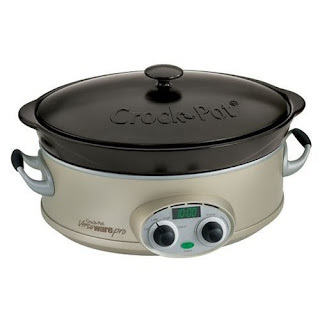 Did you frequently cook in your CrockPot prior to the blog? Yes, probably 3-4 times a week. It’s an easy thing to do. You can open a few cans and throw in some frozen meat and leave the house for the day. When I was working full-time, I would get the meat and potatoes prepared the night before and plug it in before I left the house. When I became a new mom, my children had a witching hour between 4 and 6 pm and it really wasn’t safe to be in the kitchen with them. I realized that I could plug this in at 9 in the morning or when I was cleaning up from lunch and essentially be out of the kitchen for the rest of the day. What other benefits are there when you use a CrockPot? In general, using your CrockPot can save a lot of money because you can get cheaper cuts of meat. You can get a whole huge bag of beans and really you can live quite cheaply that way. I haven’t looked too much into it, but a few people have emailed me articles that it’s a good way to go green and reduce your energy costs, especially in areas where it gets awfully hot and you are running your AC all day. I’ve had people say they plug the CrockPot in in a garage or on the back porch, to not heat up the house. It’s nowhere near as much energy as it takes to heat up the oven. How many CrockPots do you have? Five, right now. I didn’t mean to get so many - they just kind of happened. I started with a 6 quart oval that I’ve had for 3 years or so and I had a 1.5 quart mini that I used for appetizers and desserts. At Easter, I needed to cook ahead a few things because we were going to leave to go to the Rachael Ray Show. I borrowed my mom’s round 4 quart and I haven’t given it back. Then, the Rachael Ray Show gave me another 6 quart oval and then my mother-in-law gave me a Little Dipper, which actually only holds 1 cup. It’s for dipping sauces and caramel sauces. What CrockPot would you recommend for someone just getting started with CrockPot cooking? For a family of four, I would recommend a 5-6 quart. For two people, I would recommend a 4 quart. The other ones are really just novelty CrockPots for dips and appetizers and desserts. I guess if you were a single person you could get away with a 1.5 quart. You could put in one chicken breast and cover it with sauce. I have friends who have 7, 8, and 9 children and they’ll use two at a time. You can layer lasagna and then there is enough to freeze for later. There is quite a big population online of once a month cookers (OAMC). They do all of their cooking on one day and then freeze it in Tupperware in portions. They like the CrockPot because they can put a few different casseroles in those and then have their ovens free for other things. It’s very popular. 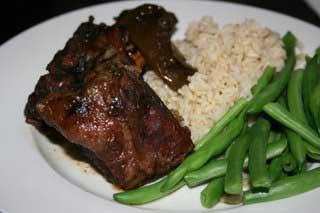 These Korean ribs are one of Stephanie's favorite CrockPot recipes. What’s your favorite CrockPot recipe? I was impressed with the Korean ribs that I made. They were delicious. I will definitely do that from now on. I was impressed with the crème brulee. We eat a lot of crème brulee in our house. I made falafel in them. I was pretty surprised that it worked so nicely and I had people write in and say that the recipe was awesome and they make falafel all the time, but they hate frying and this worked out well. That was actually the first time I had made falafel so I had nothing to compare it to. I made Frito candy with chocolate and Fritos and pretzels and peanut butter. It sounds really gross and it was delicious. I got that from the Cookie Madness site and copied it in the CrockPot. It was very tasty. Is there anything that you can’t make in the CrockPot? I can’t get a crispy chicken skin, which I would like to do. I had some people tell me that you could use foil balls and suspend the chicken so it’s not in the juice and it would crisp up, but I haven’t been able to figure that out. I tried to make mock fried chicken so I Shake 'n Baked it, but the skin was still soggy. I like chocolate mousse and I don’t know how to make that yet. The kids wanted me to make ice cream and that’s not going to happen. People who really like food – they don’t want to plug it in and have it simmer all day. I’m like an anti-food blogger, really. It comes out good, but I think most food bloggers believe in buying very high-quality ingredients. The beauty of the CrockPot (for our family at least) is that I can get a really cheap cut of meat and it turns into a nice meal. Whereas if you cook that cheap piece of meat any way else, it would taste like chew leather probably. You buy cheap cuts of meat, what about vegetables? Do you use canned, frozen, or fresh veggies? I don’t like canned vegetables. I do do tomatoes. We do fresh or frozen. I’ve roasted fresh vegetables in it and they come out wonderfully. I’ve done corn on the cob and baked potatoes.